Graphical Abstract: Partial charges in zeolites for force fields. Partial atomic charge, which determines the magnitude of the Coulombic non-bonding interaction, represents a critical parameter in molecular mechanics simulations. Partial charges may also be used as a measure of physical properties of the system, i.e. covalency, acidic/catalytic sites, etc. A range of methods, both empirical and ab initio, exist for calculating partial charges in a given solid, and several of them are compared here for siliceous (pure silica) zeolites. 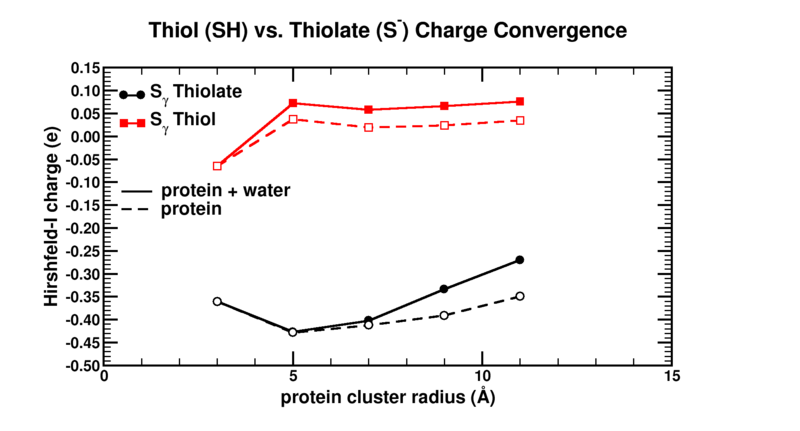 The relationships between structure and the predicted partial charge are examined. The predicted partial charges from different methods are also compared with related experimental observations, showing that a few of the methods offer some guidance towards identifying the T-sites most likely to undergo substitution or for proton localization in acidic framework forms. Finally, we show that assigning unique calculated charges to crystallographically unique framework atoms makes an appreciable difference in simulating predicting N2 and O2 adsorption with common dispersion-repulsion parameterizations. Graphical Abstract: Graphical Abstract: The influence of the cluster size and water presence on the atomic charge of active and inactive sites in Bio-molecules. Atomic charges are a key concept to give more insight into the electronic structure and chemical reactivity. The Hirshfeld-I partitioning scheme applied to the model protein human 2-cysteine peroxiredoxin thioredoxin peroxidase B is used to investigate how large a protein fragment needs to be in order to achieve convergence of the atomic charge of both, neutral and negatively charged residues. Convergence in atomic charges is rapidly reached for neutral residues, but not for negatively charged ones. This study pinpoints difficulties on the road towards accurate modeling of negatively charged residues of large bio-molecular systems in a multiscale approach. Graphical Abstract: The MIL-47(V) MOF has one unpaired electron per V site. 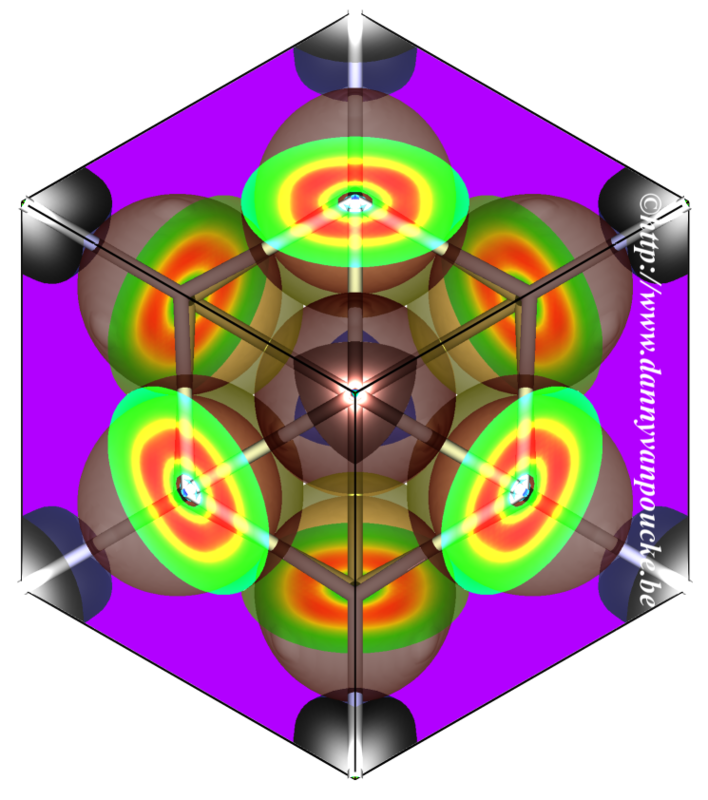 As a result, different spin configurations are possible, several of which lead to an anti-ferromagnetic state. The spin density of an antiferromagnetic state, containing only ferromagnetic chains is shown on the left. On the right, the electronic band structure of the same system is presented. The geometric and electronic structure of the MIL-47(V) metal-organic framework (MOF) is investigated by using ab initio density functional theory (DFT) calculations. Special focus is placed on the relation between the spin configuration and the properties of the MOF. The ground state is found to be antiferromagnetic, with an equilibrium volume of 1554.70 Å3. The transition pressure of the pressure-induced large-pore-to-narrow-pore phase transition is calculated to be 82 MPa and 124 MPa for systems with ferromagnetic and antiferromagnetic chains, respectively. For a mixed system, the transition pressure is found to be a weighted average of the ferromagnetic and antiferromagnetic transition pressures. Mapping DFT energies onto a simple-spin Hamiltonian shows both the intra- and inter-chain coupling to be antiferromagnetic, with the latter coupling constant being two orders of magnitude smaller than the former, suggesting the MIL-47(V) to present quasi-1D behavior. The electronic structure of the different spin configurations is investigated and it shows that the band gap position varies strongly with the spin configuration. The valence and conduction bands show a clear V d-character. In addition, these bands are flat in directions orthogonal to VO6 chains, while showing dispersion along the the direction of the VO6 chains, similar as for other quasi-1D materials. 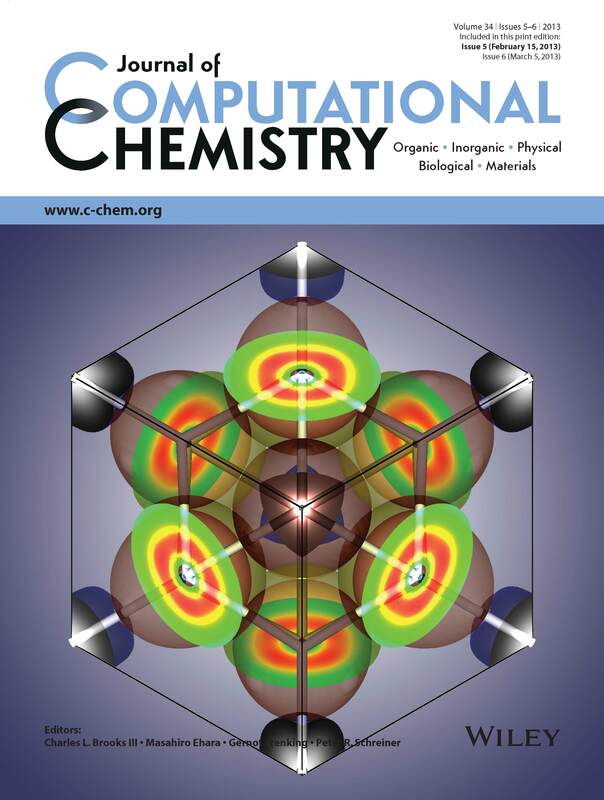 The image shows an isosurface of Hirshfeld-I “atoms in molecules” for Ti-doped CeO2, taken at an electron density of 0.03e/Å3, as presented by Danny E. P. Vanpoucke, Patrick Bultinck, and Isabel Van Driessche on page 405. 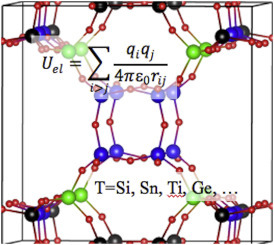 The cubic Ce0.75Ti0.25O2 unit cell is shown along the 111 direction. The different atoms are still clearly distinguishable at this iso-surface level, and show the Ti atom in the corners to be much smaller than the Ce atoms on the sides. In this issue, this implementation of the Hirshfeld- I method for solids is published back to back with a Comment from Thomas A. Manz and the authors’ Reply. Graphical Abstract:The issues raised in the preceding comment are addressed. It is shown why Hirshfeld-I is, from a theoretical point of view, a good method for defining AIM and obtaining charges. Charges for a set of ionic systems are calculated using our presented method and shown to be chemically feasable. Comparison of pseudo-density to all-electron based results shows the pseudo-densities to be sufficient to obtain all-electron quality results. Timing results for systems containing hundreds of atoms. 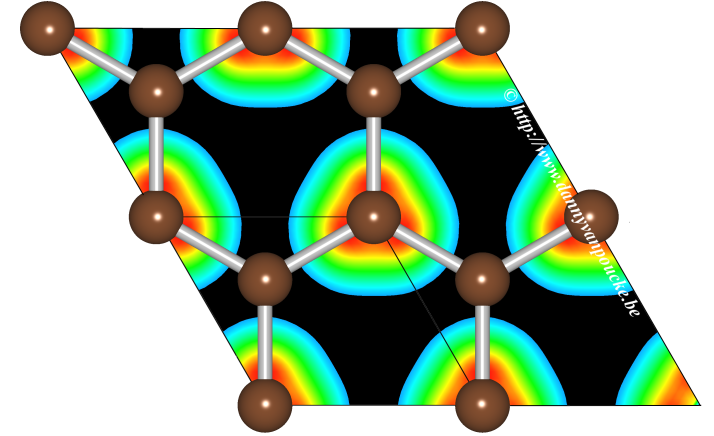 The issues raised in the comment by Manz are addressed through the presentation of calculated atomic charges for NaF, NaCl, MgO, SrTiO3, and La2Ce2O7, using our previously presented method for calculating Hirshfeld-I charges in solids (Vanpoucke et al., J. Comput. Chem. doi: 10.1002/jcc.23088). It is shown that the use of pseudovalence charges is sufficient to retrieve the full all-electron Hirshfeld-I charges to good accuracy. Furthermore, we present timing results of different systems, containing up to over 200 atoms, underlining the relatively low cost for large systems. A number of theoretical issues are formulated, pointing out mainly that care must be taken when deriving new atoms in molecules methods based on “expectations” for atomic charges. Graphical Abstract: The Hirshfeld-I method is extended to solids, allowing for the partitioning of a solid density into constituent atoms. The use of precalculated density grids makes the implementation code independent, and the use of pseudo-potential based electron density distributions is shown to give qualitatively the same results as all electron densities. Results for some simple solids/periodic systems like cerium oxide and graphene are presented. In this work, a method is described to extend the iterative Hirshfeld-I method, generally used for molecules, to periodic systems. The implementation makes use of precalculated pseudopotential-based electron density distributions, and it is shown that high-quality results are obtained for both molecules and solids, such as ceria, diamond, and graphite. The use of grids containing (precalculated) electron densities makes the implementation independent of the solid state or quantum chemical code used for studying the system. The extension described here allows for easy calculation of atomic charges and charge transfer in periodic and bulk systems. The conceptual issue of obtaining reference densities for anions is discussed, and the delocalization problem for anionic reference densities originating from the use of a plane wave basis set is identified and handled. Six new functionalized vanadium hydroxo terephthalates [VIII(OH)(BDC-X)]·n(guests) (MIL-47(VIII)-X-AS) (BDC = 1,4-benzenedicarboxylate; X = −Cl, −Br, −CH3, −CF3, −OH, −OCH3; AS = as-synthesized) along with the parent MIL-47 were synthesized under rapid microwave-assisted hydrothermal conditions (170 °C, 30 min, 150 W). The unreacted H2BDC-X and/or occluded solvent molecules can be removed by thermal activation under vacuum, leading to the empty-pore forms of the title compounds (MIL-47(VIV)-X). Except pristine MIL-47 (+III oxidation state), the vanadium atoms in all the evacuated functionalized solids stayed in the +IV oxidation state. The phase purity of the compounds was ascertained by X-ray powder diffraction (XRPD), diffuse reflectance infrared Fourier transform (DRIFT) spectroscopy, Raman, thermogravimetric (TG), and elemental analysis. The structural similarity of the filled and empty-pore forms of the functionalized compounds with the respective forms of parent MIL-47 was verified by cell parameter determination from XRPD data. TGA and temperature-dependent XRPD (TDXRPD) experiments in an air atmosphere indicate high thermal stability in the 330–385 °C range. All the thermally activated compounds exhibit significant microporosity (SBET in the 305–897 m2 g–1 range), as verified by the N2 and CO2 sorption analysis. Among the six functionalized compounds, MIL-47(VIV)-OCH3 shows the highest CO2 uptake, demonstrating the determining role of functional groups on the CO2 sorption behavior. For this compound and pristine MIL-47(VIV), Widom particle insertion simulations were performed based on ab initio calculated crystal structures. The theoretical Henry coefficients show a good agreement with the experimental values, and calculated isosurfaces for the local excess chemical potential indicate the enhanced CO2 affinity is due to two effects: (i) the interaction between the methoxy group and CO2 and (ii) the collapse of the MIL-47(VIV)-OCH3 framework.